Notes by William Henry Cooke of Stalham sent to Russell J. Colman in 1911. Norfolk Record Office, COL 8/81/2/6. 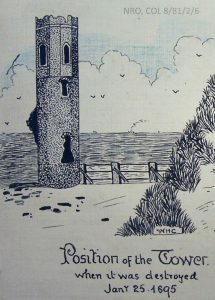 David Stannard, local historian and NORAH trustee has written this blog on an aspect of Norfolk’s coastal history, which is reflected in many of the talks on NORAH’s register of talks. In primis xxxx codge swelles, vj drage Rakes, iij new barrels with other implement[e]s thear – xviij s[hillings]. Probate inventory of Henry Hide, yeoman of Eccles, taken on 6 March 1593. Norfolk Record Office, DN/INV 9/314. 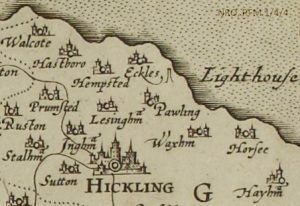 Map of circa 1602, which refers to the church tower of Eccles as a lighthouse. Norfolk Record Office, RFM 1/4/4.